LEXINGTON, Ky., June 26, 2018 /PRNewswire/ -- EnerBlu, Inc., a high power technology company focused on innovative new energy solutions for utility, military, transport and commercial applications, was instrumental in helping National Grid Ventures (NGV) win an energy storage installation solicitation in the Mid-Atlantic. The storage solution will provide peak demand reduction, voltage regulation, microgrid support and ancillary services in PJM. "It was an honor to not only be asked by National Grid Ventures to be a partner on this bid, but also very gratifying to know EnerBlu's efforts paid off in their being chosen for the project," commented Daniel Elliott, EnerBlu president and CEO. "It speaks volumes to the level of expertise that EnerBlu's eGridServices team is bringing to develop, design and monetize new technology solutions into a complex and dynamic infrastructure that provides multiple services to utilities." "We worked on this project together for nearly two years," stated Christopher Cook, EVP, regulatory affairs and head of eGridServices™, EnerBlu's division specializing in grid energy storage solutions and microgrids. "It will be exciting to see it all come together when it is operating and providing innovative storage services early next year." EnerBlu's vertically integrated approach is designed to meet utility, military, transport and commercial customers' specific needs. With over 20 years of renewable and battery energy storage deployment experience, and utilizing advanced technologies and best practices, the EnerBlu team of experts works with developers, utilities, and communities across the globe to realize the full potential of sustainable energy. They have proven to be very proficient at researching and identifying the best solutions from planning and engineering, construction and testing to the electrification of a system. "We chose EnerBlu to partner with because of their team's history and expertise installing storage projects associated with customer microgrids," stated Macdara Nash, VP, Head of Commercial Development & Transactions for National Grid Ventures. "The EnerBlu team were pioneers in the use of storage for advanced and cutting edge grid operations and stability and their experience in bringing projects from conceptual design to actual operations for real-time fast dispatch, is second to none. Their initial analysis and continued strategic advice for this project was vital." NGV is part of National Grid plc, one of the world's largest investor-owned utilities. 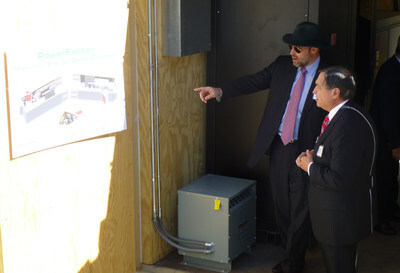 It is a distinct unit that operates in competitive markets outside of National Grid's core regulated activities across the U.S. and U.K. NGV develops, operates and invests in energy projects, technologies, and partnerships to help accelerate the development of a clean energy future for consumers. For more information, visit www.nationalgrid.com/ventures. Headquartered in Lexington, KY, EnerBlu is a leader in new energy, bringing innovative power technologies and products to organizations worldwide, with investors and shareholders from the U.S. and Europe. EnerBlu's customers are government, military and commercial organizations that are looking for sustainable energy solutions that deliver economic, social and environmental benefits. From its proprietary eLTO™ battery technology that is the cornerstone of its ePowerProducts™ division, to the eGridServices™ division that delivers microgrid and power grid services worldwide and its eTransport™ division that produces commercial electric vehicles, the EnerBlu team passionately embraces the challenge of impacting society today with smart, efficient and clean power on a global scale. For more information, visit: https://www.enerblu.energy. Statements in this press release that are not strictly historical are "forward-looking" statements within the meaning of Section 27A of the Securities Act of 1933, as amended and Section 21E of the Securities Exchange Act of 1934, as amended. These statements involve a high degree of risk and uncertainty, are predictions only, and actual events or results may differ materially from those projected in such forward-looking statements. Factors that could cause or contribute to differences include the uncertainty regarding viability and market acceptance of our products and services, the ability to complete projects in a timely manner, changes in relationships with third parties, changes in availability and costs for raw materials, and other factors related to the manufacturing of batteries generally and our products specifically. ©2018 EnerBlu, Inc. All rights reserved.